Taguig City’s Christmas gift to young girls comes in the form of a vaccine that will help them battle cervical cancer, the second most common cancer in Filipino women ages 15-44, according to the World Health Organization. The vaccine is set to immunize 6,000 female students to the human papillomavirus (HPV), which is known to cause the cancer. The beneficiaries will be schoolgirls aged 9-14 from 23 schools in the city, in what the national government said was the first such vaccination drive in the National Capital Region. 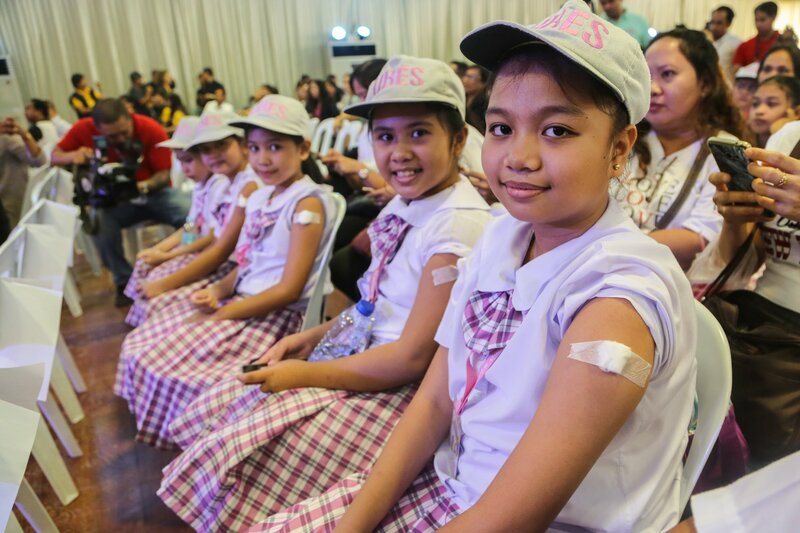 An initial vaccination of 15 Grade 4 students — made possible in partnership with the Department of Health — was recently held at Lakeshore Hall, C6, Lower Bicutan. Schoolgirls from Upper Bicutan Elementary School, Upper Bicutan Elementary School, Silangan Elementary School and Bagong Tanyag Elementary School participated in the event. “We value the health and life of every Taguigeño. If there are opportunities where we can make healthcare preventive and where we can proactively save people and families from the pains and losses to disease, we will seek them out,” Taguig Mayor Lani Cayetano said. The hallmark activity adds to a string of achievements for Taguig in the area of health especially for schoolchildren. The local government offers free prescription eyeglasses, eyegrade checkups and eye examination to students in public schools. Students also receive for free a wide range of dental services as all public schools have resident dentists and modern dental clinics. Taguig’s award-winning nutrition program targets malnourished school children. Other school-based immunization programs are implemented through the provision of Measles Rubelle (MR) and Tetanus Diptheria (Td) vaccines to all Grade 1 and 7 learners. Hindi pa man Pasko ay meron ng ibinibigay na regalo ang pamahalaang lokal ng Taguig sa mga estudyanteng babae, at ito ay sa pamamagitan ng libreng bakuna upang malabanan at maiwasan ang kinatatakutang cervical cancer. Ito ay matapos sabihin ng World Health Organization na ang cervical cancer ay pumapangalawa sa mga common cancer sa mga Filipina na may edad 15 hanggang 44. Ang bakuna ay nakahanda para sa 6,000 na babaeng estudyante upang pangontra sa human papillomavirus (HPV), na pangunahing nagdudulot ng cancer. Ang mga estudyanteng bibigyan ng libreng bakuna ay may edad na 9-14 mula sa 23 eskwelahan sa lungsod, na sinasabi naman ng national government na kauna-unahang vaccination drive sa buong Metro Manila. Ang inisyal na pag-bakuna ng 15 na Grade 4 students — na naging posible sa pakikipagugnayan ng Department of Health — ay ginanap kamakailan lamang sa Lakeshore Hall, C6, Lower Bicutan. Ang mga estudyanteng babae mula sa Upper Bicutan Elementary School, Upper Bicutan Elementary School, Silangan Elementary School at Bagong Tanyag Elementary School ang lumahok sa nasabing event. “We value the health and life of every Taguigeño. If there are opportunities where we can make healthcare preventive and where we can proactively save people and families from the pains and losses to disease, we will seek them out,” wika ni Taguig Mayor Lani Cayetano. Ang hallmark activity na ito sa Taguig ay ilan lamang sa mga napagtagumpayang programa ng pamahalaan ng Taguig sa larangan ng kalusugan para sa mga mamamayan ng Taguig, lalo na para sa mga estudyante. Ang lokal na pamahalaan ng Taguig ay nagbibigay din ng libreng salamin sa mata, o prescription eyeglasses, sa mga estudyante ng pampublikong paaralan sa lungsod. Meron ding libreng eyegrade checkup at eye examination sa mga estudyante. Nakatanggap din ng libreng serbisyong dental ang mga estudyante mula sa mga dentista ng lungsod sa kanilang modernong klinika. Ang Taguig ay nagbigay rin ng programang pangkalusugan sa mga malnourished na estudyante na kinilala naman ng gobyernong nasyunal at nabigyan pa ng award. Ang iba pa na school-based immunization programs ay ipinapatupad sa pamamagitan ng pagbibigay ng bakuna para sa Measles Rubelle (MR) and Tetanus Diptheria (Td) para sa lahat ng estudyante sa Grade 1 at 7.